YouTube sensation Zoella has decided to take a little break from the internet after it emerged she employed the help of a ghostwriter to pen her bestselling book Girl Online. Zoella, real name Zoe Sugg, has a successful YouTube channel where she blogs about fashion and beauty to about 6 million followers so her fans will be without her until she returns from her short hiatus. 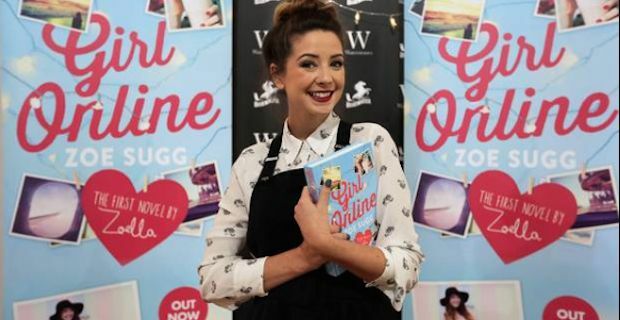 Girl Online has become a bestseller and Sugg apparently had a lot of help from the editorial team at Penguin including from award-winning author Siobhan Curran. However, she has defended suggestions that the material in the book is not her own by tweeting "Of course I was going to have help from Penguin's editorial team in telling my story. Everyone needs help when they try something new. The story and the characters of Girl Online are mine." Many people were outraged at the suggestion that the book was not written solely by Sugg and she has been labelled a fraud in some circles. In response to all the furore, Zoe tweeted that she will be taking a self prescribed "internet break". She said "Bare with me on vlogmas. I'm taking a few days out and off the internet because it's clouding up my brain. Thanks for understanding." which was followed by a love heart. It seems that the majority of fans of Zoe and her book do not care much that she did not write it all on her own and plenty of supportive messages can be found on Twitter supporting the 24 year old. @Sarah3llen tweeted "I can't imagine writing a book is easy, so good on @ZozeeBo for getting help. I don't understand why everyone is making a huge deal" and @MRCLEMENCE offered also support saying "What @ZozeeBo has achieved is phenomenal. She worked hard for it and it's paid off. Truly an inspiration for anyone."